I’m interested in asking the Zeta Service-to-Others about the history of Gobeckli Tepe. Specifically, what race of beings constructed this location, why they built it and precisely when was it built. Also, where, specifically did they come from, and most intriguing why did they leave and where did they go? [and from another]http://en.wikipedia.org/wiki/G%C3%B6bekli_Tepe The site was most likely erected in the 10th millennium BCE. At the time the shrine was constructed, the surrounding country was much lusher and capable of sustaining this variety of wildlife, before millennia of settlement and cultivation resulted in the near–Dust Bowl conditions prevailing today. Many of the pillars are decorated with carved reliefs of animals and of abstract enigmatic pictograms. The pictograms may represent commonly understood sacred symbols, as known from Neolithic cave paintings elsewhere. The reliefs depict lions, bulls, boars, foxes, gazelles, donkeys, snakes and other reptiles, insects, arachnids, and birds, particularly vultures. Vultures also feature prominently in the iconography of the Neolithic sites of Çatalhöyük and Jericho; it is believed that in the early Neolithic culture of Anatolia and the Near East the deceased were deliberately exposed in order to be excarnated by vultures and other carrion birds. (The head of the deceased was sometimes removed and preserved—possibly a sign of ancestor worship.) This, then, would represent an early form of sky burial, as practiced today by Tibetan Buddhists and by Zoroastrians in India. It is not known why every few decades the existing pillars were buried to be replaced by new stones as part of a smaller, concentric ring inside the older one. 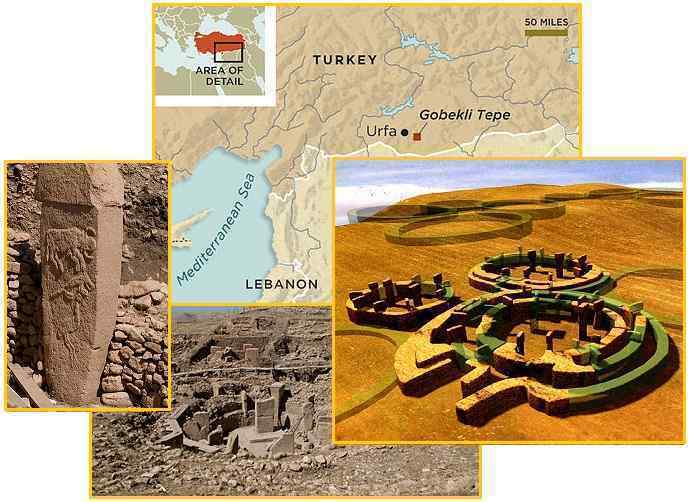 The Gobeckli Tepe site was indeed a type of religious structure centered around life and death. Early man recognized they were at the whims of nature, with droughts and disease seemingly out of their control. Longing to gain some control over their circumstances, early man would apply the psychology of what it would take to influence them. Thus in some cultures sacrifices were conducted to placate jealous feelings which man assumed the gods must feel, or gifts of slaughtered animals or grain to feed what they assumed must be hungry gods. At Gobeckle Tepe sacrifices or offerings to the gods were not done, as man in this Neolithic culture had barely turned to farming or domesticated animals. It was god who possessed food and provided it, not man who had snatched this from the gods. The climate in the region was changing from lush to desert, with both wildlife and domesticated animals dying. This is depicted in stone carvings, as the circles were a burial center. Those humans who died were prepared for their afterlife in the circle centers, and as the human culture died off, unsustainable in the desert conditions, the circles shrank accordingly.